Needless to say, my first couple of days in Chicago have been nothing short of fun. Not only was I reunited with Vishnu after three weeks of living apart, but I also got to try two amazing Chicago restaurants! My friend Ankita made a reservation for me and Vishnu at RPM for Monday night– our first date in three weeks (I am so dramatic)! 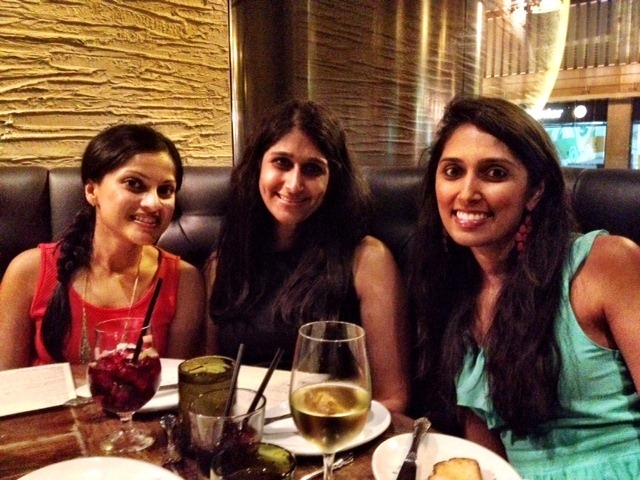 This was my second time dining at RPM and Vishnu’s first. Let’s just say this was the perfect way to kick off my month in Chicago! As we walked in, I couldn’t help but notice the chic décor – beautiful chandeliers, soft curtains – so romantic! After being seated, we spent a few minutes deciding what to order. In the end, we decided to share a few different things. We started out with two cocktails. 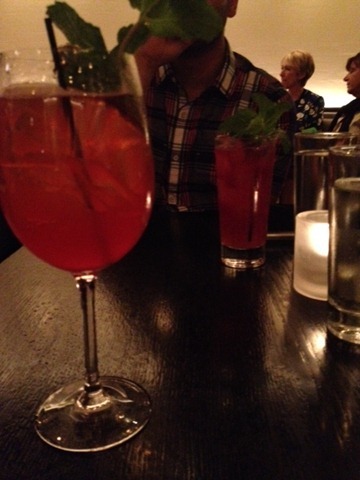 I ordered a strawberry spritzer type of drink and Vishnu got a ginger blueberry drink – summer in a glass. When our waitress told us about the appetizer special, we knew that was what we had to have. I’ll describe it as best I can – mozzarella, ricotta, mascarpone, basil and tomato stuffed baby squash tempura battered and lightly fried. Essentially mozzarella sticks taken to the next level! 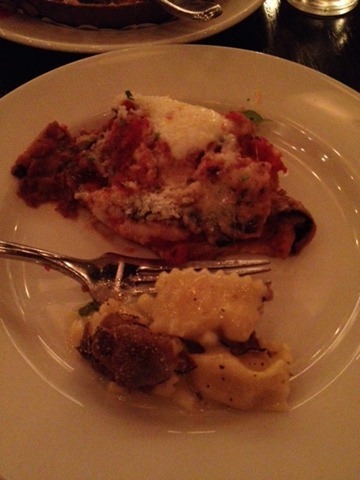 For our entrees we ordered two dishes – eggplant parmesan (SO cheesy, so good!) and this seasonal corn pasta (little ‘purses’ stuffed with roasted corn, ricotta, and mascarpone in a light butter sauce). And the grand finale was light, fluffy donuts coated in cinnamon sugar served with two dipping sauces – Nutella and whipped mascarpone. Warning – [crappy] iPhone pics ahead! The food was just as delicious as I remembered! And every dish that passed by our table looked so good! During dinner, Vishnu and I talked non-stop, catching each other up on life and planning other fun things to do in the city. I missed my man so much! On Tuesday night, we went to Sierra Tavern, except this time it was a group date! Jayesh, Ankita, Samir, Roshni, Vishnu, and I spent the evening stuffing our faces eating and talking…and laughing. Oh the laughing! No pics of food – just three lovely ladies! This restaurant also has a very special, laid back vibe. The décor is unique and welcoming – perfect for a big group of people. And our server was very accommodating and offered lots of recommendations. We were promptly seated. Then began the deliberations about what to order. We decided to order a few different things and share, which was the perfect plan because I got to try a little bit of everything! We started with beers for the guys and sangria and wine for the girls. Food wise we ordered mushroom truffle pizza, shaved Brussels sprouts salad with almonds and some kind of cheese, potato gnocci in a cream sauce, and tagliatelle with mushrooms in a truffle sauce. Jayesh and Vishnu ordered a couple of meat dishes that they also loved! 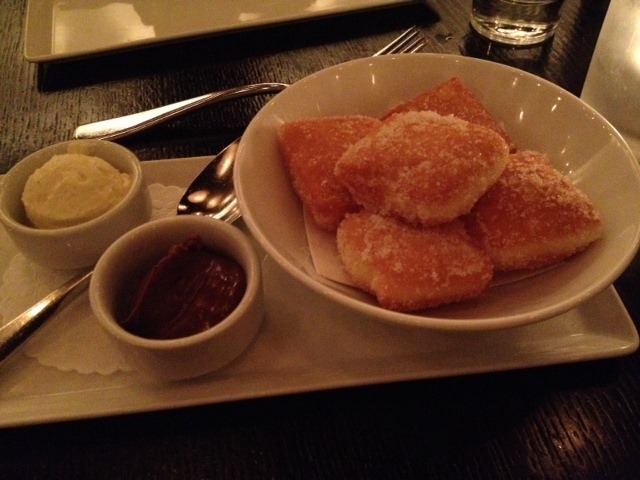 And of course, we had to order dessert – donuts! The difference between these donuts and the ones at RPM is that they were bigger and came with three sauces that you ‘infuse’ into the donut. Delicious and cool! There is a reason why everyone was so hyped to eat here. The food is out of this world! To all my fellow foodies, please make an effort to visit both of these restaurants the next time you are in Chicago. I promise you won’t regret it!